Hannah, Jesse and Sammi....three of the finest missionaries I know! They work hard and love the people around them. We were able to enjoy 3 days at a resort in Punta Cana because of the generosity of The Christian Hospitality Network and Dallas Bay Baptist Church in Hixson, TN. 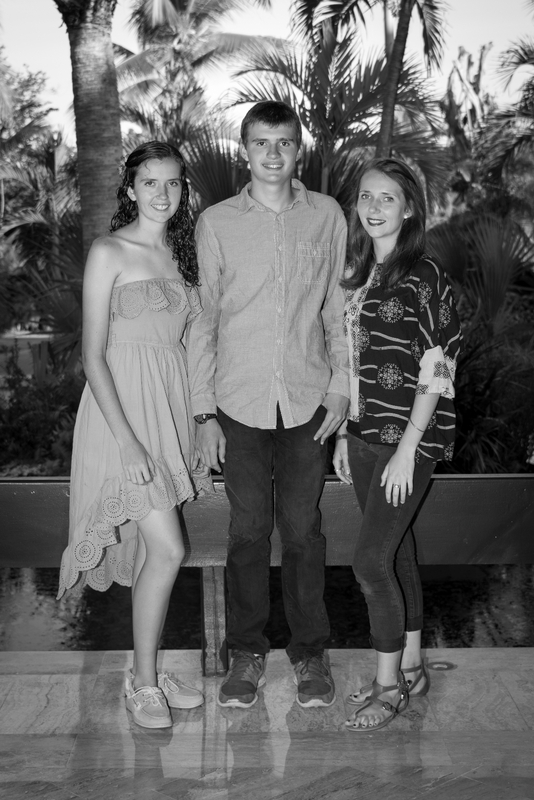 They also had a professional photographer who took this great picture of the kids. Sammi is now 20 and will be going to the states in August to work with All-Access Productions (the anti-bullying program) that is currently working in the schools in the Long Island, NY area. For more information and how to sponsor her individually please go to http://faithfuljane.com Her middle name is Jane in case you were wondering. Hannah is turning 18 in just a couple of weeks. She has one more year of highschool and is a joy. She is always making us laugh with a witty comment. She has been a real encouragement to another young lady here who is 6 days younger than her. 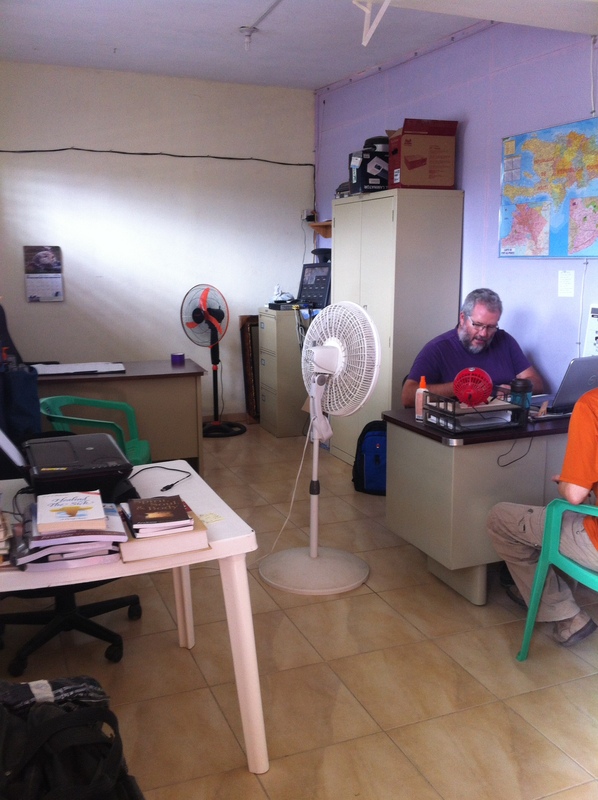 She will be overseeing the Justuff store on the YWAM base here in Azua. It is a little store that sells soda pop, snacks and tshirts amongst other items to staff and visitors. Jesse is 14 and is quite the worker. He works hard and is usually happy even while working. He has started helping in the garden here on the YWAM base and will be taking it over when Tyler leaves in August to attend another YWAM school. Agriculture and self-sustaining gardens are a much needed thing here in the desert land where everything costs so much to purchase. He is also quite pleased that he is taller than his sisters. Everyday we must keep an eye on our water supply. We only get water from INAPA, the water company, every 7 to 10 days. So we really have to watch how much we use and that we don't run the cistern dry and mess up the pump. We get very little rain as we are close enough to the beach that the sea breeze blows the rains away. We watch the sky cloud up and the rains come over the inland mountains and even hear the thunder many days... and then the breeze blows it away. We live in a desert area where watering of essential plants is needed. Water is essential to our bodies as well. Water is also only a good thing when it goes where it is meant to go. The balance of having water but having it IN the pipes and in the toilets etc...not the imbalance of having water run down the hallway or all over the bathroom or kitchen floors or out of the tanico onto the ground outside. Balance is needed. The Bible describes Jesus as the Living Water and we need to check every day how our "water" supply is. Are we spending time with Him? Unlike with our water supplies and rain here, we are in control of how much He comes into our lives. We also need to have a balance in our lives. If I spend every waking moment in the church, who will tend to my children? We need to balance having a constant flow of Jesus in our lives as we go about our daily tasks. Keeping Him always in our minds and on our tongues. Always sharing Him with others whether this comes from giving a hug or giving a cold glass of water or by showing someone where in the Bible it says that God loves them and sent His Son for them. Learning these life lessons and sharing them with the people of the Dominican Republic are part of what we do here. Balance is a big deal here with Christians. They don't always see that you can play baseball and be a Christian. Many churches here require their members to be in church 7 days a week. Learning to keep Jesus forefront in your life inside and outside of the church building is a lesson we are working on to model and to teach to others. Thank you so much for your support in order to live and purchase needed items. This "moto" and the car in the background are very needed for us here in Azua where we drive 40 mins to the nearest grocery that has safe meat. Thank you! 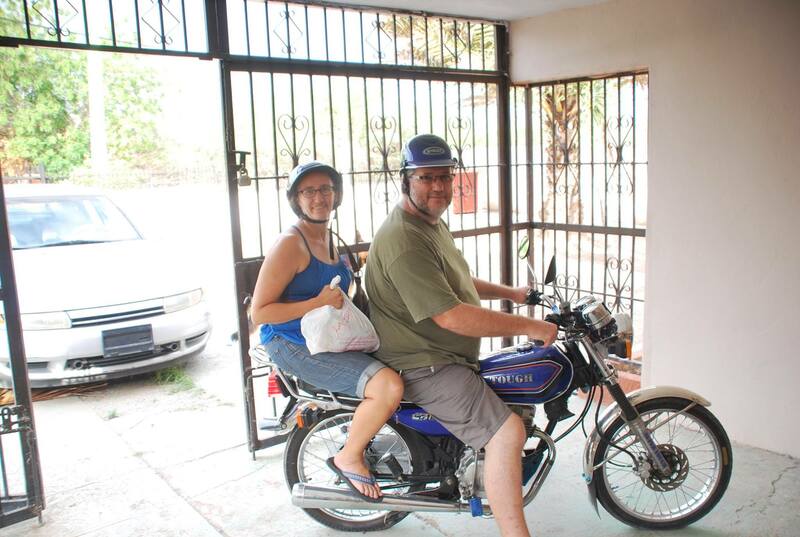 The "moto" is much cheaper to drive for local errands and ministry so we use it more often plus it is a great way to cool off..
Ned doing what he does well. Ned is working a lot in the office here. Their accountant left after his 2 year commitment about 2 weeks after our arrival so Ned is filling a much needed spot here on staff. We love mail and are also not able to get things as readily and cost effectively here. If you would like to purchase a needed/wanted item and send it to us, please send me a message. We have some items that could be purchased at Walmart for as little as $5 but are unavailable or too expensive here. 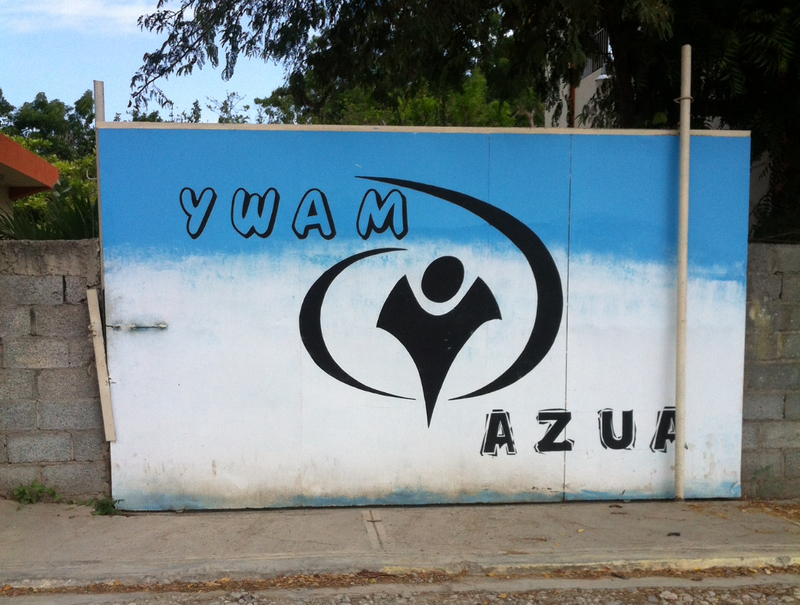 Life here at YWAM Azua is much different from the city of Santiago. It is more of a frontier town, much like an outpost town between two cities or areas. 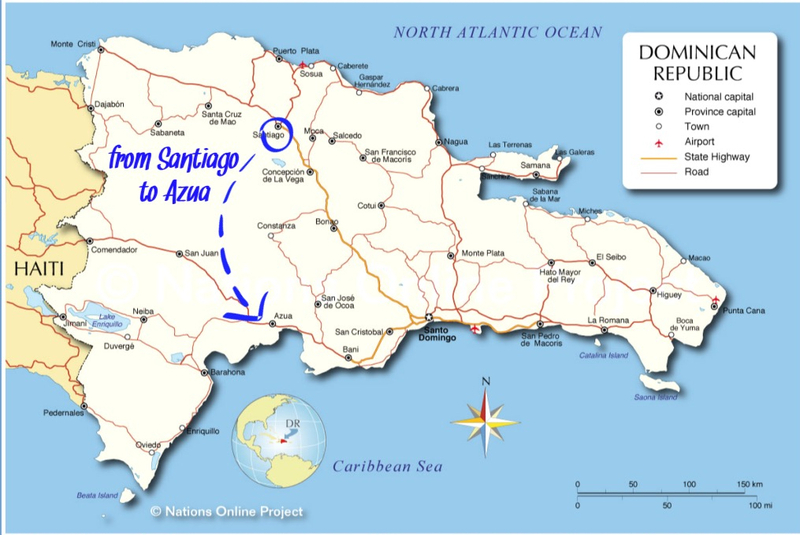 We are about halfway between Santo Domingo and the Haiti border on the south coast of the Dom Rep. The local stores are about the size of a local convenience store and sell about the same items with similar pricing. It is small town in which almost everyone knows everyone or is related to them. The town pretty much knows that the white people live down the road to the beach, though some think we are German because we own a German Shepherd dog. So it is a nice town with nice people who need discipleship and need the love of Jesus. What a privilege to show them God's love. 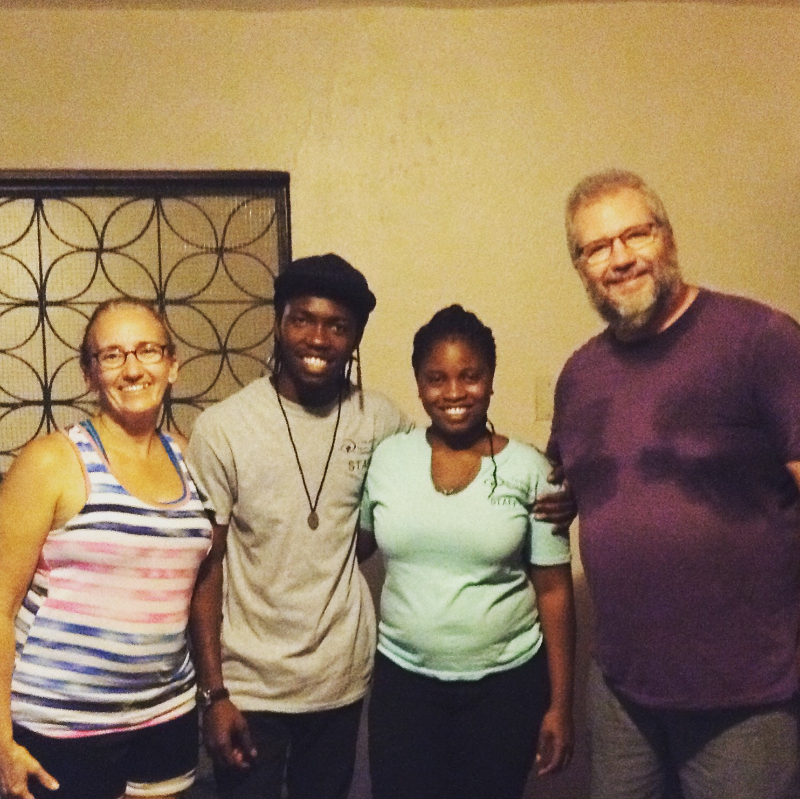 They are a sweet young Haitian couple who just got married in March. We have started mentoring them in their marriage. We in no way have all the answers about marriage but walking through the adventure of life and marriage knowing that you have a couple who may have walked through it before and who will pray with you is a blessing. We are excited about this new chapter in our lives. Marriage is something that takes a lot of work and commitment but mainly takes a lot of prayer. Please pray for us as we help them walk together in marriage. And if you have any great marriage resources, please share.